Doctor Neha: Hi and welcome, Katie. I’m so glad we get to be in Bali. Tell me, what communication question do you have? I’m putting you on the spot. Katie: I want to know how to approach a situation when my friend is undermining everything I say. Doctor Neha: So it’s like you’re trying to share with your friend. What might your friend say back to you? Katie: They say things like “Why would you do that?” “That’s so stupid.” Questioning what I’m doing in my life. Doctor Neha: OK, the first thing you want to think about is what might be this person’s intention. What might be their intention in saying, “Why aren’t you going to do that?” or “That’s so stupid” or “Why would you do something like that?”? Katie: Maybe to keep me safe. Doctor Neha: Sure, if I had a friend that was doing something that I thought might not keep them safe, that could be a reason I’d say something like that. First, you always want to look underneath what they’re saying to see what is the intention behind their words. OK, now, do you think that’s what this friend is doing? Doctor Neha: OK, so it wasn’t quite that clean. What other ideas do you have about what’s going on? Is this a pattern? Have you seen this behavior before? Katie: It’s a pattern. It’s often when something exciting is going on in my life and I share it with her. She tends to respond with doubt or reasons why it might not be something to be excited about. Doctor Neha: Ah, OK. So this might be a little more complicated. For example, we’re in Bali and you know that flying across the world can bring up some fear or doubt and it can also be exciting. So did this behavior happen in part around the trip you took here to Bali? Doctor Neha: OK, so this gets juicy. I want you to think back to remember the things that she was worried about for you. Because there are always outside voices and then there’s your inner voice or knowing, your own intuition. So remember one thing that she said to you about this trip. Katie: She said that a healing session that I was getting was not safe, especially without a medical professional around. Doctor Neha: Okay. So what she might be saying is “I’ve never tried that before. And so that is scary to me.” But the way she says it is “Don’t do that” and “That’s not safe. You shouldn’t do that. Where’s the medical person?” So did you end up getting the healing session? Doctor Neha: And you don’t look like anything unsafe happened. Doctor Neha: OK, so what was what I call N=1? As medical professionals, there are these double-blinded placebo-controlled trials that we call our data that we hang our hat on and use to publish papers. But then there is N=1, which is your knowing, your intuition, your experience. Doctor Neha: How did you feel afterward? Katie: Great, and not only did I get one of them, but I aIso got six sessions. So I carried on. Doctor Neha: OK. So it sounds like your friend’s voice may have hindered you in the past, but that your N=1, your own intuition, your own voice has gotten stronger. Is that true? 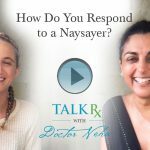 Doctor Neha: So your result at the end of this experience is how you can stay connected to this person while still being true to yourself. So you might say something like, “It sounds like you think that this is unsafe without a medical professional—and it’s something you’ve never tried before. So it seems scary. Thank you for caring about me enough to share that with me. It sounds like that if you were given the same choices as I’m being given, you would’ve made a different choice.” Because it sounds like she would have made a different choice. Doctor Neha: And that’s okay too. You look pretty darn happy with your choice. You feel good and ready to go back to tackle the world. Doctor Neha: Awesome. So for those of you who know that sometimes voices from others are scared because you’re willing to risk and try something new, it’s okay. Acknowledge their fear and thank them for caring about you. Then make sure you let them know “It sounds like given the same choices you would have made a different decision.” There’s not a lot to say after that. You got it? Doctor Neha: All right, we’re good. Thanks. Repeat back what you heard the other person say. Listen beneath their words for their fear or concern—and name it. Pause to consider whether you also share that fear or concern. If so, then evaluate and weigh the gravity of that concern. If not, thank them for their honesty and sharing their opinion. Do what your heart tells you is right. Do You Complain That You Don’t Have Enough Time? 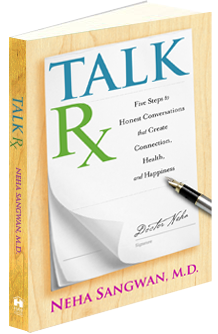 Buy a copy of TalkRx for your Friends and Loved Ones! Order your copy now on Amazon or Barnes & Noble!